You thought that because it was a new year that I would be starting to get over my fixation with certain inanimate objects, didn’t you? You thought that my focus would shift to living things like birds and trees and puppy dogs, did you not? Well, I like photographing those things too but I still love my inanimate objects. And, of course, the most beloved object of all is (drumroll) the CHIMNEY POT. 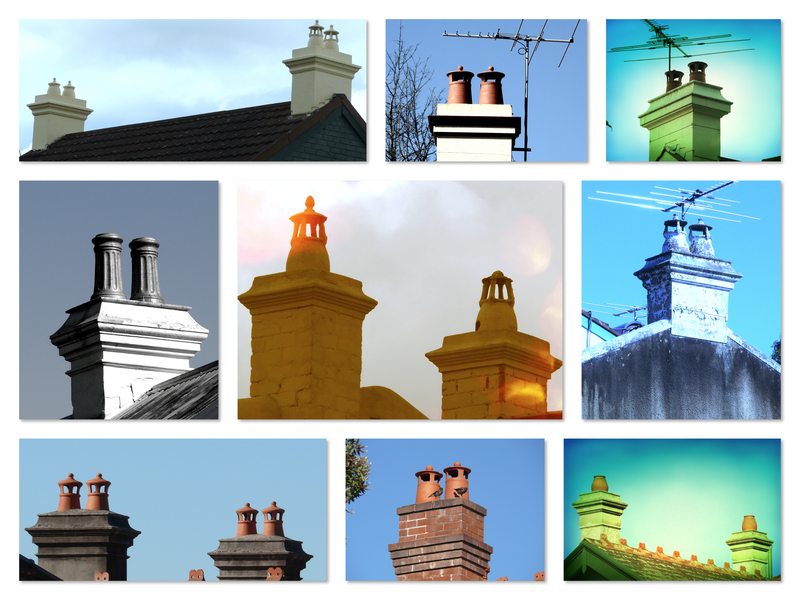 Did you know there is a chimney pot hierarchy? I didn’t. 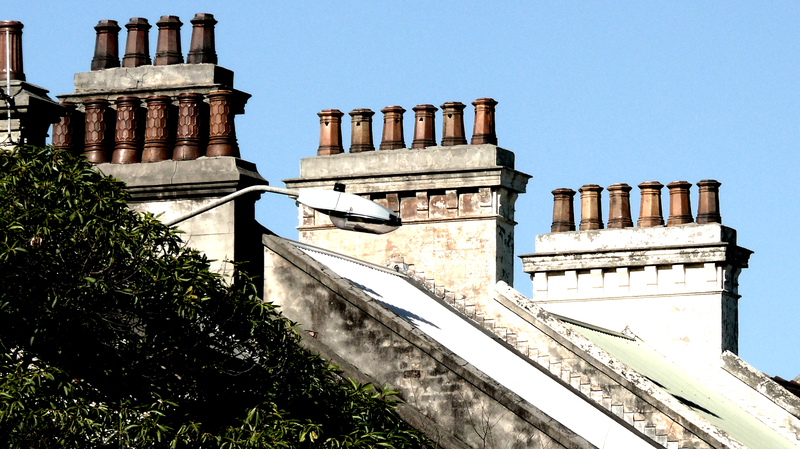 I was speaking to my neighbour, June, the other day, who has lived in the area for over fifty years and she told me that the more chimney pots you had back in the day, the greater the status symbol. A chimney pot meant you had a working fire place which meant that not only could you afford to keep your fireplace in order, you could afford the fuel to run it. So I set about to see if there was any evidence that this chimney pot pecking order might be true. Now, of course there are exceptions, but generally I found that the lowlier single storey semi-detached houses in the area had one chimney pot; while the grander two or three storey detached terraces had umpteen chimney pots. Now there are more rooms to heat in the bigger houses so it stands to reason that there would be more chimney pots, but maybe the size of the house wasn’t taken into account when it came to chimney pot hierarchy, maybe it was all about the pots. Imagine ladies back in the day gazing up at their three or four chimney pots thinking: In your face single chimney pot people. In your face. And there is nothing like a smoking single pot. It conjures up images of hot cocoa, sweet woodsmoke and toasty toes. Some people have got it made. However, regardless of whether there be one or two or ten, I still love my chimney pots. A quaint reminder of days gone by. Good on you, Mags. We have to stand against this. If censorship came in we probably wouldn’t be allowed to blog as we do. Can you imagine? I do love the humble chimney. There’s just something about it that makes me smile! I didn’t know that. How interesting. That is the kind of stuff that I love hearing about – how the ordinary person voiced their support (or not) for revolutionary thought. That is so cool, slpmartin. 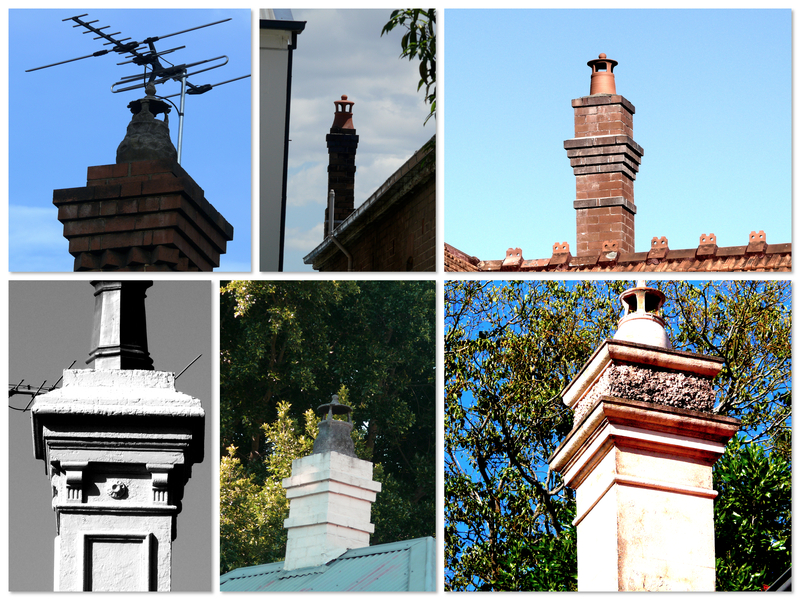 I didn’t know there were so many styles in the chimney pot line! Love them all! You don’t see many chimney pots in this country, Selma. I lived in an old farmhouse once with a fireplace and chimney and decided to make a fire the first winter I was there. I struggled to get the fire started – it wouldn’t draw – but I knew zilch about fires and chimneys and so I persisted. Eventually there was a bit of a plop-crunch-smoosh and out of the chimney into the fireplace fell a big bird’s nest! Empty, thank goodness! Some of them are quite fancy, aren’t they, Adee? There must have been chimney pot makers around at the time who made all the different styles. I’ll need to research it. Oh yeah. I’ve had several birds nests up the chimney and in one case a real, live possum. Thankfully the possum was in a disused chimney. I would have hated to set fire to the little guy! Oh yes, Rachel. Hospitals have the most fantastic chimneys. There is a sandstone one near here that has elaborately carved chimneys. They are quite beautiful. I’ll need to visit there soon. Oh hooray, I’m loving the return of your chimney pots! What a beautiful collection. I love them too – their shapes, the images they invoke, how they kind of look like little fat men strutting about on chimneys everywhere. Love a lot. I love your little fat men image. It’s so true. They wouldn’t look out of place with faces and moustaches, would they? Hahaha. Can you believe the deluxe chimney pot package? Hooley dooley, that’s a lot of firewood. Hope they don’t chop it themselves! That last photo? HOLY INCREDIBLE! That’s what I think. It’s amazing!!!!! We spent yesterday evening sitting & talking around an open fire at the Red Lion in Salisbury …. got me thinking; 15 houses in our street, and only ONE chimbley pot! Plenty on sale at the Garden Centre, though … apparently, they make good planters. I have used some as planters and they are very good. A few got cracked in my old house (I don’t mean to big note myself but I had 4 chimney pots in that house. Haha…) by a family of possums constantly jumping from pot to pot at night, so I had to get them replaced. They were so nice I couldn’t throw them out so I put plants in them. They looked really good! Sigh! You take the best photos and make inanimate things come to life. Love you for that (just one of the many reasons). 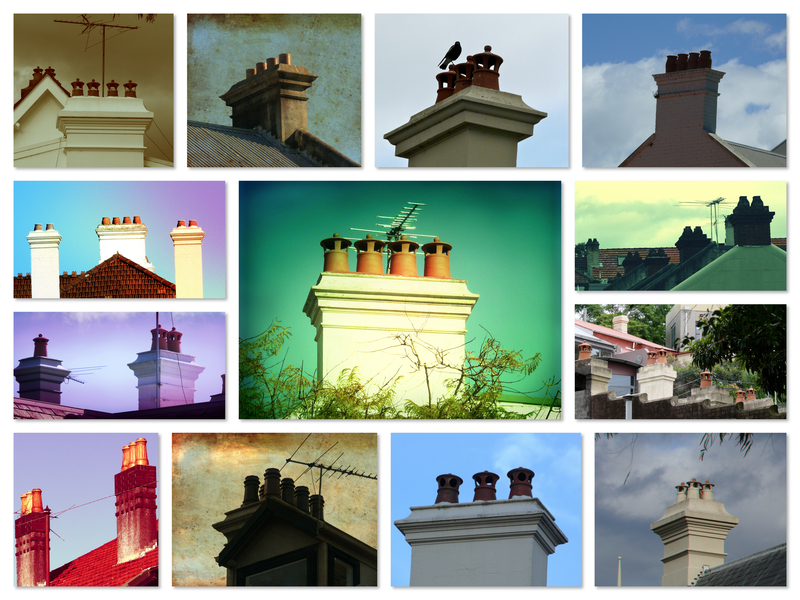 Hee-hee, what great shots of chimney pots! I had no idea there was a hierarchy of sorts. You’re right, though, few things conjure a feeling of warmth and tranquility as a smoking chimney. I didn’t know about the hierarchy either, Steph. 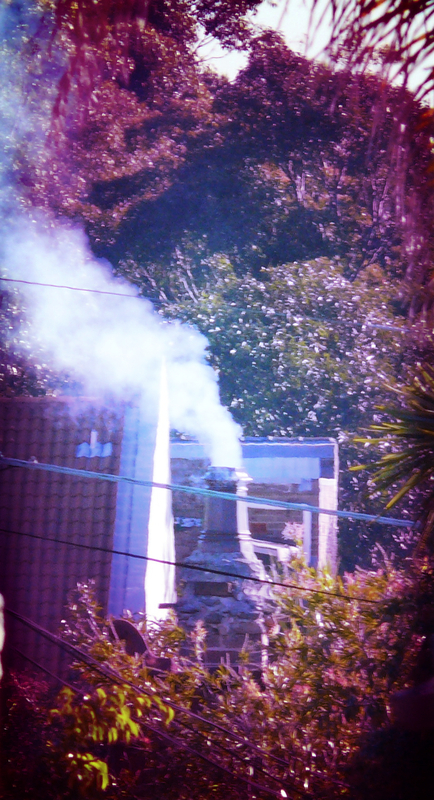 Amazing what you learn just by wandering about… and yes, there is such a sense of the tranquil with a smoking chimney.